We all like a challenge–that’s a big reason why many of us love this sport of table tennis. So the staff here at Ping Pong Depot has come up with a fun challenge for you and your friends that will also help a deserving youth. We’re calling it the Win-Win-Win-Win-Win Challenge. You can win a $100 Gift Certificate and then pay it forward by giving an additional $100 gift certificate to your favorite future champion. Our challenge is simple. Show your expertise by correctly predicting the winners of the 5 events at the World Championships—Men’s Singles, Women’s Singles, Men’s Doubles, Women’s Doubles, and Mixed Doubles. The person who picks the most winners will win the two gift certificates. These gift certificates are as good as cash, so can be used on all brands, all products, and all items at regular price or on special—absolutely everything at PingPongDepot.com! If more than one person ends up with the most correct predictions, we’ll have a drawing to determine the winner. Click on the banner above to go to our special contest page for full details and to start picking your winners. 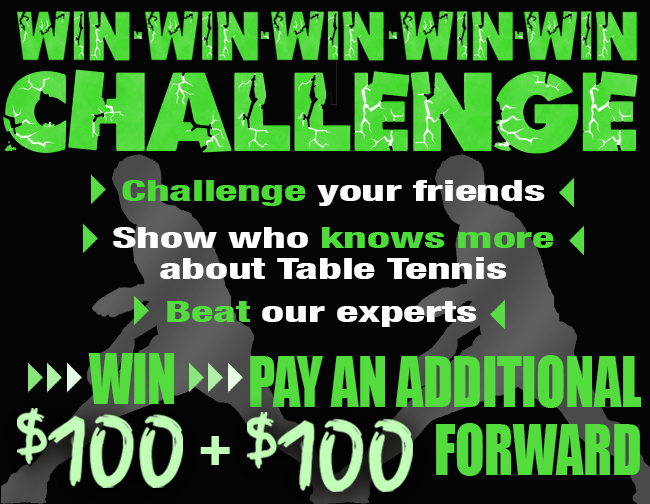 Challenge your friends to see who is truly a Table Tennis Modern Day Expert (no, J.O. Waldner, Lui Guoliang, Deng Yaping, and Stellan Bengsston are not in the running!). Or see if you can do better than our in-house experts (Mitch, Larry, Thierry, Yang). Their choices will be revealed in the coming days on the contest page. It’s fun, it’s easy. Entries close in just 10 days, on May 29, when the World Championships begin in Düsseldorf, Germany.